Most Americans I have encountered have never really had a good sushi experience. Some have never tried it at all, while others have had that “one” experience that scarred them for life. I wish I could take these people by the hand and help reshape their misguided ideas about sushi. If they tried a delicious roll, and hated it, I would leave it alone, but most have never had that chance. The first time I ever ate sushi, I was living in Florida and strolled in (by myself) to the unknown territory of a Japanese restaurant. I sat at the sushi bar and looked over the menu. Nothing made sense, expect maybe the teriyaki chicken. I decided on a $6.50 bento box that came with miso soup, salad, teriyaki chicken and a California roll. Everything I tried tasted different and delicious. Then the sushi chef leaned over the counter and asked me if I wanted some sauce for my sushi. I didn’t know what he was talking about, so I just said, “sure”. What he handed me was a delightful pink sauce, something I had never seen. As I dipped my California roll into the sauce, my roll was transformed. It went from a 4 to a 10 on the flavor scale in an instant. The sushi chef and I got to talking, and realized we had a lot in common. We started a friendship that led to game nights and hang outs, and of course, he would always make the sushi! I am so grateful for that day that I bravely strolled into that Japanese restaurant, and for that moment when my world opened up just a little bit more, and for the friend that I found in the sushi chef. Maybe this is why I am so fond of sushi, because my initial experience was such a great one. I ventured out from that point and tried all sorts of sushi, and the one that I have yet to top is the shrimp tempura roll. Fatning, and not quite Japanese as much as some southern fried delight, this roll is AMAZING. I would love to sit down with some sushi doubters and let them try this roll, and see where they stood after that. 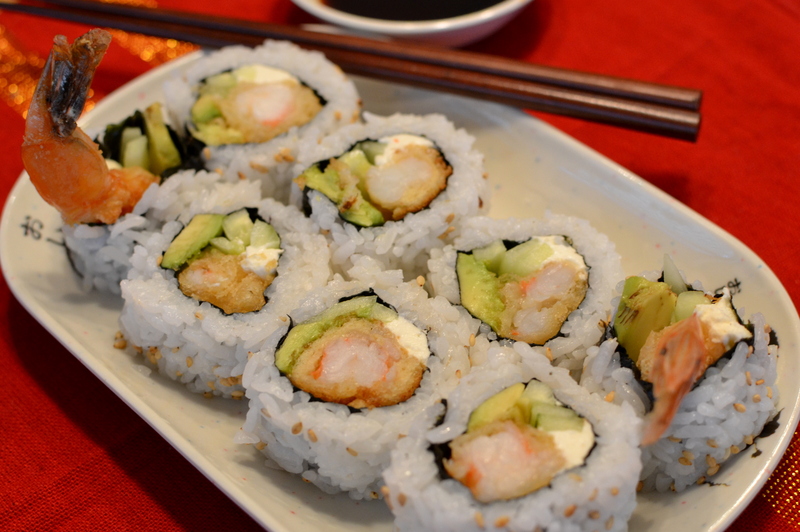 Of course, being gluten intolerant, I can’t have normal tempura or soy sauce, so currently my only option for my favorite sushi is homemade, and let me tell you, this is an awesome recipe. 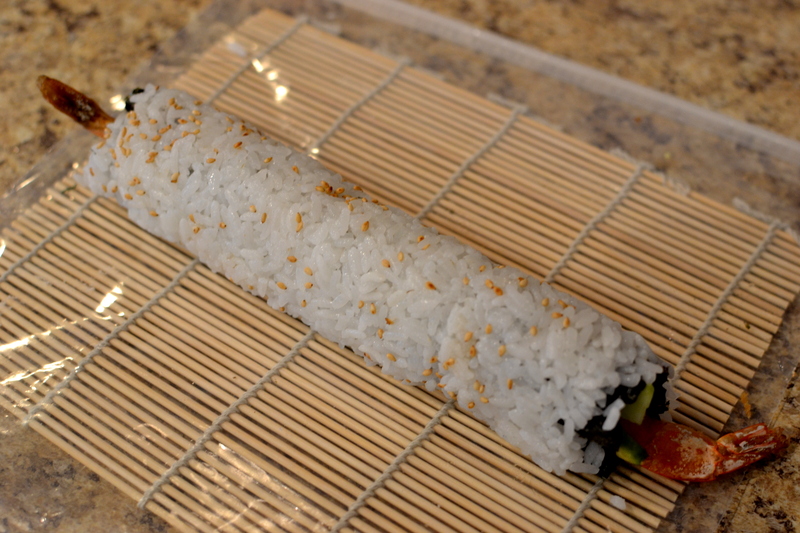 Tastes authentic of what my taste buds remember, and once you get the hang of it, making sushi gets easier and easier. Make your spicy mayo by adding mayonnaise and sriracha in bowl. Should be pink and slighty sweet. Mix to taste. Cut your avocados and cucumbers and set aside. Cut ¼ inch thick strips of cream cheese and set aside. Prepare shrimp by rinsing and peeling. 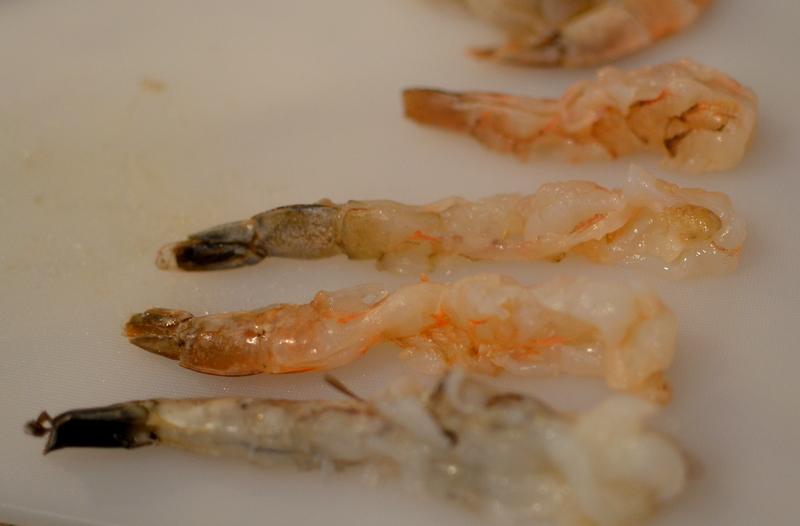 (Leave the tail on) Lay shrimp flat and flatten out by pinching with your fingers. This will help the shrimp to stay flat. Start to heat oil in small saucepan over med-high heat. 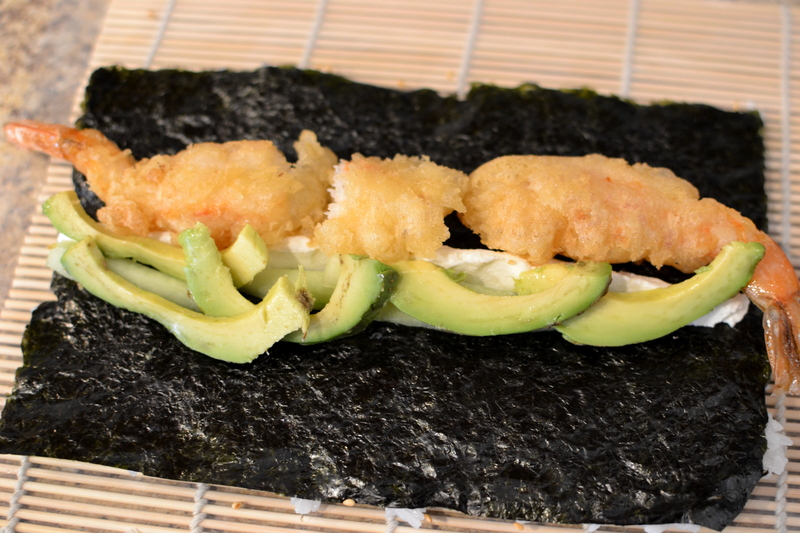 Make your tempura by mixing your flour and baking powder. Add in cold water and gently mix. Do not overmix, your tempura should be lumpy. This will help it to stay light. 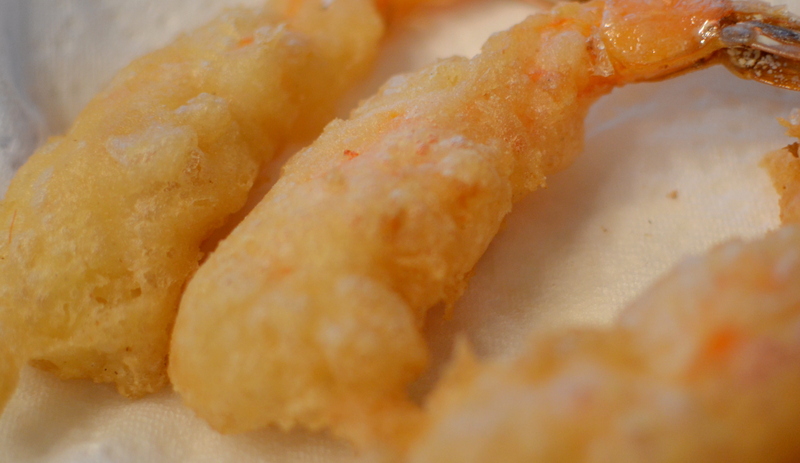 Once your oil is hot, dip your shrimp (except tail) into batter and fry. This should take a few minutes each. Shrimp will start to turn golden when done. If they are burning or turning to deep brown, reduce your oil heat. Place cooked shrimp on paper towel to cool. Place your nori shiny side down on bamboo mat. 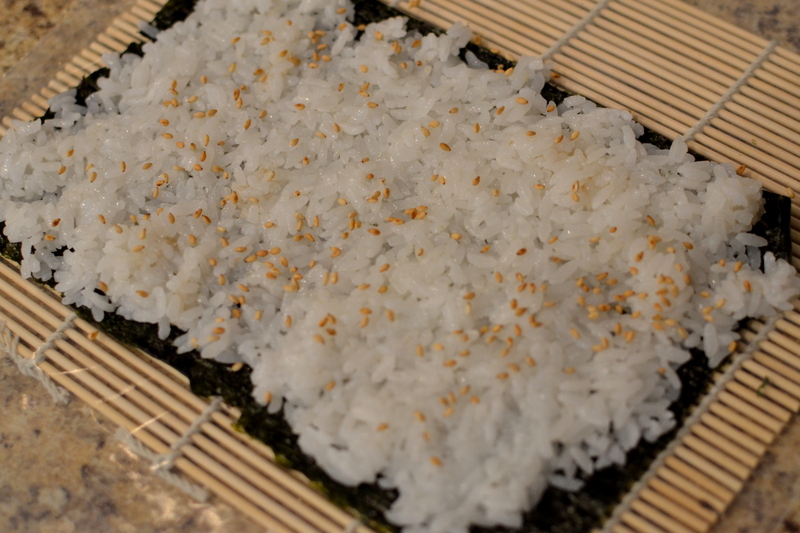 (Cover bamboo first with gallon size ziplock) Wet hands, and spread ¾ cup rice over nori. Sprinkle with toasted sesame seeds. Cut into 8 pieces with sharp knife. Wet knife between cuts for a cleaner cut. Drizzle on spicy mayo. ENJOY! This entry was posted in Japanese Recipes, Uncategorized and tagged celiac, gluten free blog, gluten free recipe, gluten free tempura, gluten-free, how to make sushi, japanese, sushi, tempura. How much water do you add to the flour and baking powder?